It's back, and man did it make a sound. Across the OUA, 10 out of 11 schools kicked off their seasons with Labour Day Classics. While most turned out to be exactly what most reporters, fans and analysts thought, others already created a a stir heading into Saturday's games. Let me get one thing straight off the bat -- this is the first week. A lot can change in a nine-week, eight-game season, and one win or loss does not necessarily mean the team will win the Vanier Cup. But for a lot of people watching, there were signs of interest in the five openers. The featured game for this week -- both slightly biased, but also rightfully so considering the outcome -- is the Laurier versus Toronto game, where the score took a back seat to the plethora of records broken. A 1-7 record haunted the team for 10.5 months heading into the season opener on Monday, but Laurier didn't seem to miss a beat from the opening kickoff. "This has been building inside since last year and after last season when it ended in October, we had this in mind," head coach Michael Faulds said as the rain poured down at Varsity Stadium. "We were waiting for this moment. This moment was building for 10 and a half months." "A lot of built-up energy was just exploded right now." Dillon Campbell, the 2013 OUA leading rusher, posted 293 yards on 16 carries to average out 18.3 yards per carry. He broke a Laurier single-game rushing record -- last held by Nick Cameron in the 2005 OUA semifinal with 251. Faulds says he's faster than he was last year -- does that scare anyone else aside from me? "Honestly, I just ran, I didn't know," Campbell smiled when asked about his record. "[I didn't know] until the coaches on the sidelines told me I had this many yards or that many yards. I just did my thing and ran." 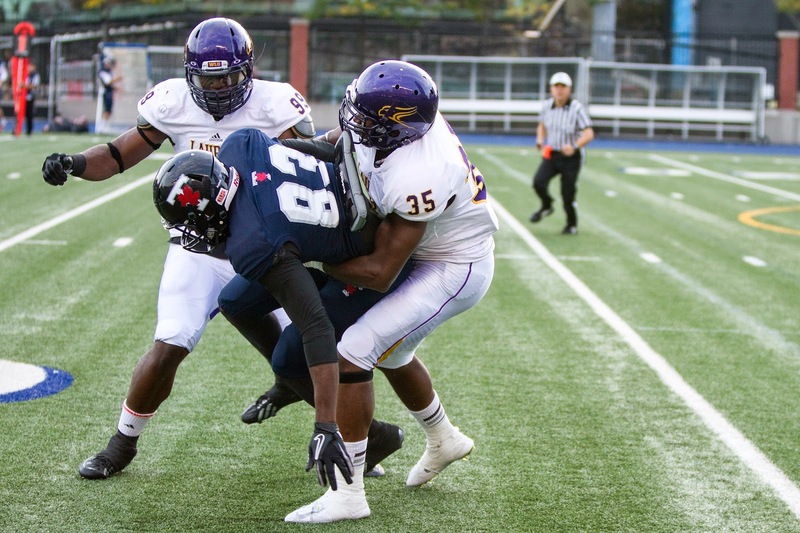 Kwaku Boateng recorded four sacks in the opener to set a Laurier single-game sack record. Marcus Arkarakas recorded his first-career touchdown early in the game. Greg Nyhof eclipsed 100 yards in a game for only the second time in his career. Kicker Ronnie Pfeffer added almost 10 yards to his average punt, recording 46.4 yards per punt while sending his kickoffs 61.5 yards. Laurier won their opening game for the first time since 2011 -- a win against York -- and recorded the most points in a game since scoring 69 against Waterloo, also in 2011.
Who is this team that just a year ago struggled with their worst record since 2002? There are still glitches in the Hawks' system, and Faulds noted that after. "There are a couple things. We need to correct the drop-balls by receivers and we need to correct how many penalties we had. By no means was it a perfect game regardless of how many points we put up. There's a lot to improve on here." There were holes in the defence that allowed Toronto's Simon Nassar to switch to a passing game and gain some ground before the half. Laurier quarterback James Fracas -- while boasting impressive numbers in his first game back -- still held onto the ball too long at times and had Faulds yelling "throw it away" when Fracas was chased out of the pocket. Does this mean he played bad? Absolutely not. But this does mean there's still work to be done for when they play the teams that boast stronger systems. But for now, with the Windsor Lancers being the only "real" contender out of the first five games, Laurier could potentially go as good as 5-0 to start the season. If this happens, there's good potential for Laurier to not only have a record above .500 for the first time since 2009, but storm into the OUA playoffs. My second-favourite game of the day. The game had a high tempo from the moment it began and proved that for the second year in a row, Mac and Guelph could be each other's biggest opponent. The defence on both ends of the field was solid -- defensive lines were holding everything, making both Marshall Ferguson and Jazz Lindsey look lackluster. It didn't help that both had issues with their systems - Ferguson couldn't stay consistent with the plays and Lindsey is a much better scrambler than a play-by-play quarterback -- he went 14-for-30 and 195 yards. I was entirely team Windsor for this game -- Queen's quarterback Billy McPhee lost almost all of his weapons going into this year and let's be honest -- I just don't want to see Queen's at the top of the margin anymore. While the outcome was predicted, Windsor deserves a lot of credit for staying with the Gaels for the majority of the match. Being down as much as 15-0 at one point, the Lancers stormed back behind the arm of Austin Kennedy to not only tie the Gaels, but take the lead. Kennedy went 26-for-41 with 393 yards and three touchdowns. Let it be noted: Queen's still has weapons despite the loss of Giovanni Aprile and Ryan Granberg, but McPhee is forced to focus on receivers with no running back with half the strength of the departed. For a bottom-feeder matchup, this was interesting. I had no expectations of Carleton coming into this game -- yet they surprised me from the opening kickoff. Carleton jumped out to a 10-0 lead and forced Jamie Cook to throw two interceptions. Carleton had 510 yards of total offence compared to Waterloo's 336. This is the FIRST win for Carleton since coming back to the OUA last season. While yes, it's against Waterloo -- a team that has been notoriously known as an "easy" win -- the Warriors also stomped all over the Ravens last year with a 47-8 victory. Carleton fixed mistakes and can find the endzone. It'll be interesting to see if they can sneak out another win against a team like York. Probably the most anticlimactic game of Monday's affairs was the inevitable blowout everyone saw coming from a mile away. Ottawa rolled over York, and it was sad to just watch on my awesome OUA.tv split-screen set up. I never once turned on the audio because the score alone was enough to make me sigh. York has some work to do, friends. The defending Yates Cup champions kick off their season on Saturday after a bye-week against a less-than-challenging opponent in the York Lions. I'm a little weary that Will Finch may break a hole in the Lions' defence.